Yasiel Puig may have a new address, but he's promising to be his usual eccentric self. As with every offseason, plenty of players have changed teams. Yankees reliever Zach Britton didn’t switch teams, but he did change his name. Don’t call him “Zach.” It’s “Zack” now. Here are some notable player movements and notes from around baseball that hopefully are a little more interesting. Patrick Corbin was considered the best free-agent pitcher on the market. He landed in the NL East. Patrick Corbin, widely considered the top starting pitcher in free agency, landed in Washington. The Nationals rotation — Max Scherzer, Stephen Strasburg, Corbin, and Anibal Sanchez (also added in free agency) — is probably the best in the division. The Phillies made a run at Corbin, who’s had just one start at Citizens Bank Park in the last five years. That will change in 2019 as the Nationals play nine games in South Philly. The defending-champion Red Sox’s most interesting questions are in the bullpen. They chose not to re-sign closer Craig Kimbrel (and his goofy delivery) and watched setup man Joe Kelly sign with the Dodgers. Two-time All-Star shortstop Corey Seager is back from the Tommy John surgery that ruined his 2018 and forced the Dodgers to trade for Manny Machado last season. He avoided arbitration by settling for $4 million, significantly less than Machado would have commanded. Brad Ausmus spent last season as an assistant to Angels general manager Billy Eppler, which will help his transition to manager. Mike Scioscia, the skipper since 2000, stepped down. The Angels have been to the postseason just once in the last nine seasons and haven’t won a postseason game since 2009. Score that as a ground-rule double-talk. The rival Cardinals, however, were aggressive in free agency. They signed reliever Andrew Miller and traded to get Arizona first baseman Paul Goldschmidt, a six-time All-Star who hit 33 bombs last year. Goldschmidt also struck out a career-high 173 times. Miller is another guy the Phillies reportedly coveted. Miller is one of a handful of veterans the Indians let go. Outfielder Michael Brantley (Astros), closer Cody Allen (Angels), and Edwin Encarnacion (Mariners) are among the others. They’ll also start the season without star shortstop Francisco Lindor, who has a calf injury. Former Blue Jays All-Star Josh Donaldson is in the National League for the first time, playing third base for the Braves. Donaldson had a lost season last year because of injury, so he had to settle for a one-year, $23 million contract. (We should all be so lost.) He averaged 37 home runs from 2015-17 and reportedly will start off by hitting second in the order, ahead of Freddie Freeman. » ANALYSIS: Do Harper and Machado want to play here? The Big Maple is in the Big Apple. The Yankees’ biggest acquisition was left-handed starter James Paxton from Seattle. Paxton has top-of-the-rotation stuff, provided he can be healthy. The only time he’s seen the postseason has been on TV, so the Bronx Zoo will be a different experience for him..
Yasiel Puig has gone from the sunshine of L.A. and perennial contention for the World Series with the Dodgers, to Cincinnati, which has finished last in the NL Central each of the last four years. 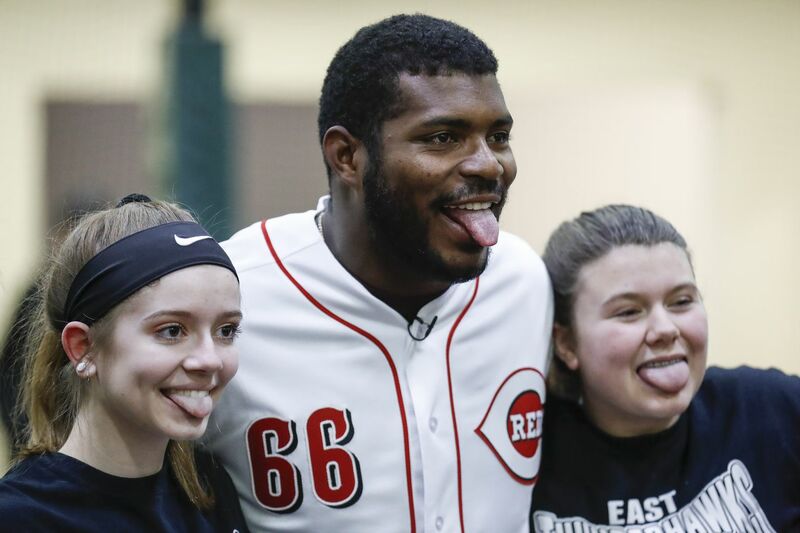 Not sure Cincy is ready to make a run, but at least Puig promises to continue his bizarre superstition of licking his bat. This guy is so nuts.